This post shows how to use Fluentd’s MongoDB plugin to aggregate semi-structured logs in real-time. 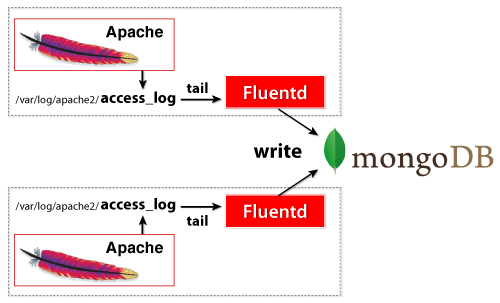 This post shows how to import Apache logs into MongoDB with Fluentd, by really small configurations. The figure below shows how the things work. The match section specifies the regexp to match the tags. If the tag is matched, then the config inside the <match>...</match> is used. In this example, the mongo.apache tag (generated by tail) is always used. The ** in match. ** matches zero or more period-delimited tag elements (e.g. match/match.a/match.a.b). flush_internal indicates how often the data is written to the database (MongoDB in this case). Other options specify MongoDB’s host, port, db, and collection.